It’s been a while since I cooked a good homemade meal. I wish I could say that I was a good wife who cooked dinner every night. You would think as a food blogger, I would cook a lot more than I have been lately. Well, folks, it’s the time of year when my job takes over my life. I’ve been working 10-hour days the past several weeks. And putting in extra time on the weekends. So I have trouble mustering up the energy to cook dinner. 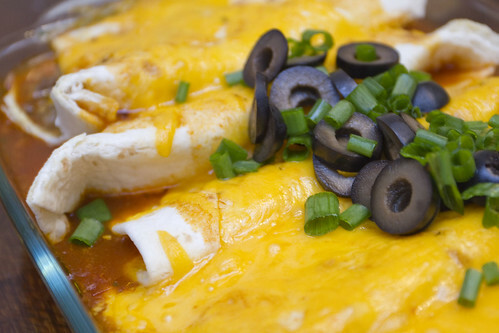 This weekend, though, The Nerd made a special request: Enchiladas. And, being the good decent wife I am, I obliged. In a large saucepan over medium heat, whisk together the canola oil and flour and cook for 1 minute. Pour in the enchilada sauce, chicken broth, cilantro, salt and pepper. Bring to a boil, then reduce heat and simmer 30-45 minutes. Meanwhile, brown the meat and onions in a large skillet. Drain off the fat and stir in the green chiles and seasoned salt. When the sauce is ready, pour a bit of it into the bottom of a large baking dish, completely covering the bottom. Now it’s time to assemble the enchiladas. Spoon some of the meat mixture into a tortilla. Add some grated cheese, green onions and olives and roll them up. 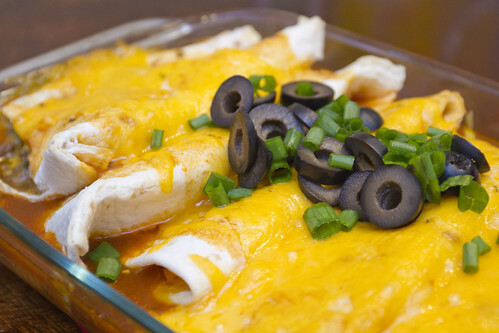 Place the enchiladas seam-side down in the prepared baking dish. Pour the remaining enchilada sauce on top of the enchiladas, making sure not to spill out the side of the pan. You may have some sauce left over. Top with the remaining shredded cheese and bake for 20 minutes, until sauce is bubbly. Garnish with some sliced olives and green onions and enjoy!